The result of the 2015 election will be underpinned by a curious and slightly counter-intuitive concept: the less that changes on polling day, the more that could change the day after. To put it another way, there’s a greater likelihood of uncertainty and turbulence if only a few dozen seats change hands, rather than a lot. This is because the state of the parties is set to be so finely poised that the lower the total number of gains and losses, the higher number of probable outcomes. A binary outcome (i.e. a clear and comfortable win for either the Tories or Labour) will take place only if many dozens of seats change hands. But a less specific outcome (i.e. one that leaves no party with a majority, but the potential for a variety of different coalitions) will come to pass if far fewer seats are won and lost. For example, if the Tories make a net loss of roughly 25 seats and Labour a net gain of 25, both parties could end up with around 280 seats each. Then if the Lib Dems only win 30 seats, neither a Tory-Lib Dem or Labour-Lib Dem coalition would total enough to reach the target of 326 seats for an overall majority in the House of Commons. So how many seats could change hands overall – and how would this compare with previous elections? 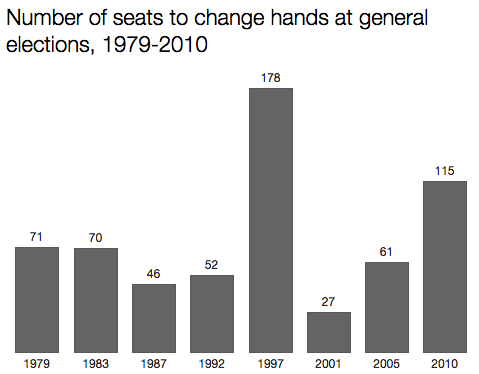 A turnover of 70-80 seats would have more in common with the elections of the early 1980s than more recent contests. A lower number would fit in with those of the late 80s and early 90s. But remember that all the elections shown in this chart, bar 2010, produced an outcome with a clear majority for one party. What’s more, my prediction of a turnover of 79 seats would result in another hung parliament and not, as per 1979 or 1983, a majority government. That’s what makes this election so fascinating. Even the third highest turnover of seats in the past 40 years would still lead to a hung parliament and a range of possible outcomes. An awful lot needs to take place on 7 May for the election result to produce even one clear winner. Which seat might see the highest turnout?